When choosing a good, any level of roast will work. I’ve used 100 proof bourbons with this recipe. 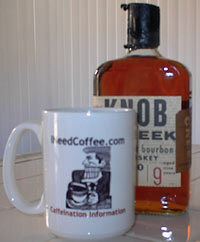 One good inexpensive 100 proof bourbon is Knob Creek. But remember, no more than one cup each time. Try it my friend, guarantee you too will enjoy it. Oh, as an added attraction, I would always have a jar of the wiskey full of fat Bing cherries soaking until each cherry was equivalent to 1 shot. Gracious sake, everybody loved my crazy coffee! Enes is a grammy that gets a kick out of using the internet with her "little ol' WebTV", which was a Xmas present from her daughter.